I haven't dared to read those massive scriptures by JRR Tolkien, but I have in fact tried to sit through the movie series, which I feel is quite boring. But anyways, check this video out, LOTR explained in three simple steps, one of my all time favourites! Well, I haven't read either HP or LOTR. I am happy with 'Thakumar Jhuli' and Sukumar Ray's 'Abol Tabol'. Infact, there are some parallels between these stories. But then, hasn't Steven Spielburg 'lifted' Satyajit Ray's (Sukumar Ray's illustrous grandson) original script, tweaked it a bit and made: "ET"... which was a blockbuster... ??? Ray was supposed to direct that movie... but he was unaware of the way Hollywood functioned. Another American was paid all the money and given all the credit for the story while one of the production giants copyrighted it in their name. And today they have the gall of pointing an accusing finger at Bollywood... and threatening to sue the latter, for copyright violation and over royalties... ?!! 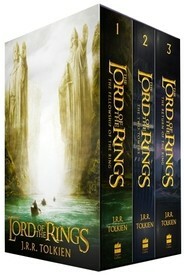 I have been thinking of reading 'LOTR' ever since I have seen the movies... guess I should give it a try too!! I didn't like what they did to "Harry Potter" either in the movies. Especially the 5th part. I guess converting such huge masterpieces of creativity into a limited-duration movie is just not possible! LOL! Indians always keep coming crying after their work is stolen! Guess we need to have more foresight... or else stop cribbing. Hellooooooooooooo! There is no plagiarism in HP! And if u say one word against HP, I will stab you and vomit over your feet! The 2 are poles apart! In fact, I can't believe people actually have the galls to make any comparison between the two! Both are masterpieces in their own genre! And there's more to both than what is visible to the eyes! Lots of "in-between-the lines" in both. It would be really foolish to say one is better than the other... for they just can't be compared! You should... though I don't have too much respect for movie adaptations of novels. Go on and read it... although don't even think of comparing it with HP. There's no similarity between the two! And if you start with the thought that it is like HP, you'll be disappointed and might not be able to complete it. Read it for itself... it's a masterpiece. I've just finished it and I already want to read it again! You can also try Eragon. But in general the essence of the books can be gotten from the movies, and in case of the LOTR, I felt the hobbit and rabbit thingy is too tough for me to digest! I don't know abt that yaar! If I'd seen HP5 before I read the novel, I wud hv hated it! As for "the hobbit and rabbit thingy"... yeah even I was finding very difficult to relate to it initially... but eventually I found out they are just some names given to the species inhabiting the world at the time the story takes place... whether fictitious or real, I don't know. The story, however, holds true in all eras of time... just like our own great epic Mahabharat! There is a Sauron creating havoc in the minds of each one of us! Showing us a future full of doom and despair that hasn't yet happened! The news people, doctors, lawyers, religious leaders, politicians and miserable soap-opera makers constitute his army I guess. There is also a Gandalf amongst us at all times... in whatever shape or guise he may choose to come. And we are the Frodo, the Sam, the Merry and the Pippin... ordinary people... who get chances to do extraordinary things... but the choice remains ours... whether we want to take the chance or not. Thanks for visiting my blog. :) Hope to c u around again! Yupp... have to download the movies now... making space in my HDD... it is full! Cool! That's what I would like to download and watch! Do u have a link for a torrent... for the extended edition of the movie? I finally managed to take a break... did u see my Farm today? Dude! I can't believe u hv read all the 7 books of HP... completely! Because, except for occasional references to the term "Dark Lord", the 2 series are as different as the Sun & the Moon! 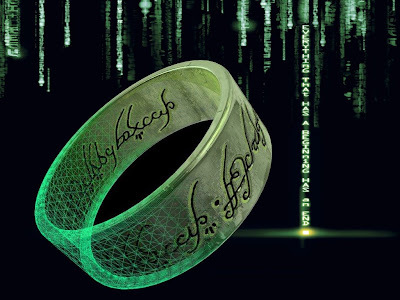 And the Ring, well, LOTR is only about Rings... that's it's basic plot! Whereas in HP, there is only 1 mention of any ring, a family heirloom of Voldemort which he uses to make one of his horcruxes. It's just such a small part of the entire series! How can u even compare the 2 of them! 4 ??? As far as I know there are 3 volumes of LOTR... the first 2 volumes with 2 "books" each and the last one with the 5th book and some background material on the characters and stuff. I have only skipped that last Appendix. And technical or non-technical... I don't see any plagiarism! They are 2 completely different series in the fantasy genre, I'd say... but so is Enid Blyton's "Enchanted Woods" series! HP is totally abt Wizards, but LOTR has only 2 Wizards in the entire plot - Gandalf & Saruman! Folks in LOTR don't need wands or magical incantations or spells to do magic! Neither do they fly over brooms! As for the theme... that there is a bad guy with his army of evil things... and there is a good guy, with his team... and their fight for power... well that happens in all such stories, doesn't it? Look at Ramayan for example - Raavan & Ram. And Mahabharat - isn't Krishna so very similar to Dumbledore and Gandalf... guiding the "good" team to emerge victorious over the "bad guys"! And our Bollywood movie Mr. India... isn't Mogambo looking for something too to make him invincible! How can this be termed as plagiarism yaar?